OPM's polymer-based cranial implants, made with additive manufacturing technology from EOS, offer improved patient outcomes with reduced surgical costs. Oxford Performance Materials (OPM), South Windsor, Conn., made medical history last year when they received the first Food and Drug Administration (FDA) 510(k) clearance for their polymer laser-sintered OsteoFabTM Patient-Specific Cranial Device (OPSCD). 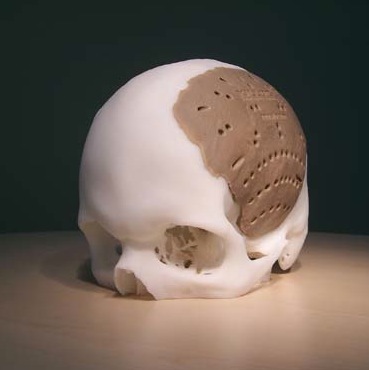 The customizable implant is designed to restore voids in the skull caused by trauma or disease. Manufactured in a matter of hours with additive manufacturing (AM) technology from EOS, the implant saw its first use just a few days later, when the device was successfully implanted in a patient missing a significant portion of cranial bone. "It was very large, measuring nearly six inches across," says OPM President and CEO Scott DeFelice. "The fit was perfect." That's good news for the patient. The right implant means less time on the operating table, quicker recovery, and reduced possibility of infection. Hospitals benefit as well—typical operating room rates run upwards of $60 per minute, so pressure is high to manage the costs of patient care. Says DeFelice, "The new medical paradigm is about improving outcomes while reducing costs. That's what additive manufacturing technology helps us accomplish." A contributor to this latest advancement in healthcare is the OsteoFabTM technology, OPM's brand for additively manufactured medical and implant parts produced from PEKK material (see Technology Developer Works at Intersection of Advanced Materials and Additive Manufacturing in Will Additive Manufacturing Take Flight?). PEKK (Poly-Ether-Ketone-Ketone) is DeFelice's favorite molecule, and is a high-performance thermoplastic with many exceptional properties (see Sidebar, A Peek at PEKK). The plastic has a number of mechanical and thermal qualities that make it highly suitable for cranial reconstruction. It has a density and stiffness similar to bone, is lighter than traditional implant materials, such as titanium and stainless steel, is chemically inert, and is radiolucent so as not to interfere with diagnostic imaging equipment. Perhaps its most exciting attribute is bone's affinity to the material. "PEKK as a molecule is unique," says DeFelice. "Based on research studies, it is osteoconductive, meaning bone cells will grow onto it, unlike some other materials." In some implants, the surrounding bone pulls away from the site over time. "With most implants, the fasteners are really important, because if you don't get bone to grow into the implant, you're relying on screws to hold everything in place forever. That's a big problem that can be solved with osteoconductive materials." DeFelice adds, "Since PEKK has shown osteoconductive properties, long-term implant stability may be easier to achieve than with other materials. And given the correct implant design, results become even better. You can get a multiplying effect by increasing surface area, and achieving intimate contact between the implant and native tissues. That's a portion of what led us to laser sintering, and ultimately, to the OsteoFabTM process itself." Because OPM needed to produce low-volume parts with complex shapes, AM was a logical choice. "It was a natural evolution," explains DeFelice. "We were selling PEKK as a raw material in pellet, film, and extruded bar stock for orthopedic and spine applications, but on occasion we'd receive a request for a one-off with a complex organic shape. Typically they'll say, 'Your material is mechanically like bone, it's biocompatible and can be EtO [ethylene oxide] or gamma sterilized. How can we get it in a variety of shapes?' People were already molding and machining it, but from a practical perspective, these processes have substantial limitations in terms of tolerance and geometry. So we started looking at options." Laser sintering lifts manufacturability restrictions that traditional processes impose—for instance, draft angles in molding and corner design for CNC tooling. It also doesn't require the upfront costs of tooling and molding, so it is well-suited for creating one-off, patient-specific parts. And laser sintering doesn't generate the level of waste that subtractive cutting and milling do. For OPM, opting to laser sinter the cranial implant was by far the best choice. However, PEKK (like its cousin, PEEK) has a high melting point relative to other polymers, so all current commercial AM processes were immediately removed from consideration until OPM discovered EOS, makers of the high-temperature EOSINT P 800 laser-sintering system. "EOS is clearly the leader for high-temperature industrial 3D printers," says DeFelice. "We found their technology to be the only laser-sintering system in the world that can run high-temperature materials such as PEKK." Since that selection, OPM has developed a long-term relationship with EOS. "They were with us when we explored this business opportunity, which ultimately led to the implementation of a P 800 system in our South Windsor, Connecticut facility around two years ago. We were a fairly early adopter of high-temperature laser fabrication, and in the context of the OsteoFabTM technology's entire development cycle, we moved very quickly. EOS supported us throughout the process." It wasn't just a matter of buying a system one day and making a product the next. The path to commercialization of patient-specific implants was arduous. Aside from the not-so-trivial prerequisite of the right molecule and the right process, DeFelice says climbing the mountain of regulatory requirements was a daunting task. "For starters, you need an ISO 13485 compliant facility that has design controls and an appropriate clean manufacturing environment. That's a pretty big step. You need to be compliant with CFR 21 cGMP (current Good Manufacturing Practices), and that's also a big step. Add to that a completely validated process and ISO 10993 biocompatibility data on your finished parts. In short, you need a lot of stuff in your bucket." The lifecycle of a patient-specific cranial implant starts with the patient. DeFelice sets the scene: "Say you're in a car accident and you hit the windshield, injuring your skull. Once you reach the hospital, they clean up that area. After the swelling goes down, they do a CT or MRI scan, producing what is essentially a slice file that is not too dissimilar to the data you actually build parts with via laser sintering." Upon review by a physician, that slice file is sent to OPM. Using 3D design software, a team of design engineers creates an implant based on the file to precisely fit that patient's anatomy; hence the term "patient-specific." "Once you have that, you get approval of the implant design from the surgeon, and then print or 'grow' the part," says DeFelice. The "growing" phase, the actual manufacturing, is entirely automatic. The laser-sintering system lays down a thin layer of powder on its build platform. Guided by the lowest slice of the implant design file, a high-temperature laser melts a cross section of the implant design. When that layer is done, the build platform lowers, the system distributes a new powder layer on top of the old one, and the laser melts the next cross section. The process repeats until the entire implant is built. Laser sintering is capable of producing practically any shape geometry to match the precise needs of an individual patient. Once the implant is removed from the leftover powder, it's ready for quality inspection. "In addition to mechanical and analytical testing, we use a structured light scanner to do 100 percent line-of-sight metrology inspection to certify the dimensional accuracy of the final product, and then the implant is shipped to the hospital," DeFelice says. "The total process from receiving the data to shipping the implant takes less than two weeks." Oxford Performance Materials and BIOMET Microfixation have entered into an exclusive global distribution agreement for cranio-maxillofacial (CMF) implants, including the OPSCD. Biomet, a major medical device manufacturer and marketer with representatives and subsidiaries in about 90 countries, will distribute them in the U.S. and internationally. Having successfully created and obtained clearance for their cranial product, OPM is making plans to move throughout the body. "There's no region of the human skeletal anatomy that won't be touched by this technology," says DeFelice. "We are engaged in a comprehensive program to look at all areas. If you're missing a bony bit anywhere in your body, we're committed to obtaining the necessary regulatory clearances to meet that need." Despite the many doors opened by AM technology, OPM remains focused. DeFelice says they're not interested in making the next custom jewelry or cell phone skins. Instead they will only operate in highly regulated, high-risk markets, such as medical. "We're after critical parts, and biomedical is the pinnacle of that," he says. "That means you need the right material, the right process, the right quality system, and the right metrology. When the patient is on the operating table and the part shows up and doesn't fit, you're putting someone's life at risk. With the first implant case, where the implant was very large, large areas of critical tissues are exposed during surgery. Every second is critical in that situation." Oxford Performance Materials is thoroughly committed to using high-temperature laser sintering with PEKK going forward. To patients in need, that's welcome news. The combination of laser sintering and PEKK creates a far-reaching potential beyond just partners in industry—together, they're lifesavers. While PEKK shares some of the qualities of its better-known cousin PEEK—high mechanical strength, heat resistance, and biocompatibility, to name a few—OPM CEO Scott DeFelice says that PEKK is no ordinary thermoplastic. "If polymers were ice cream, PEEK would come in vanilla, strawberry, and maybe chocolate. That's it. PEKK, on the other hand, is more like an entire ice-cream shop, with dozens of flavors." The difference is structural: PEEK is a homopolymer, made up of identical monomer units. By contrast, PEKK is polymorphous. That means PEKK has lots of molecular "knobs" that the team at OPM has learned how to turn. By adjusting the polymer's manufacturing process, or incorporating different additives, they can move melt points, crystallization levels, and mechanical properties. The result, according to DeFelice, is "a rich toolbox" capable of supporting many different applications and a variety of customized materials from the same base molecule. Since 2000, DeFelice has built OPM's business solely on the shoulders of PEKK. Aside from developing a variety of biomedical and industrial materials under the brand name OXPEKK®, OPM has produced a number of what he calls "bony void" replacements—including cranial implants, mandibular and orbital augments, and spinal cages—using their patented OsteoFabTM process,. DeFelice is optimistic about the future of PEKK and OPM. The company is a participating member of the National Additive Manufacturing Innovation Institute (NAMII), a White House initiative to advance additive manufacturing as a critical process in the U.S. "In the context of NAMII, we're establishing what are called B-Basis allowables, which are structural design parameters for aerospace use, for PEKK," he says. "We're very active in that market." In addition to their recently FDA-cleared OsteoFabTM cranial implant, OPM is providing OXFABTM materials and critical parts for other demanding sectors, such as the nuclear, aerospace, chemical processing, and semiconductor industries. As DeFelice says, "After fourteen years of mixing, blending, and modifying this molecule, we're just getting started."